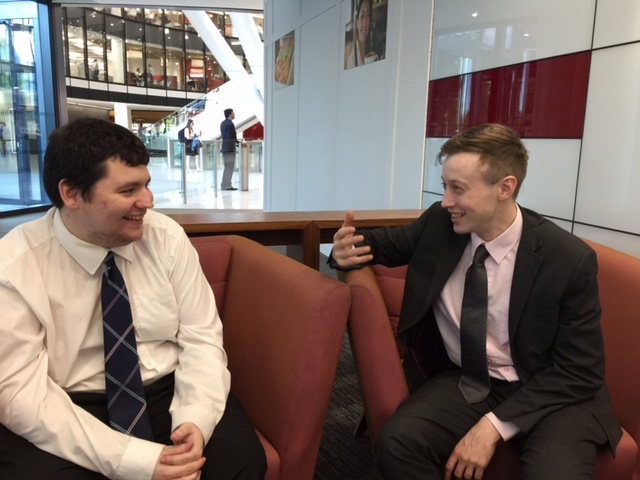 Whilst in the London office, I bumped into Phil – one of the Mitie managers in Service Solutions – seen on the right with Jamie ex-Growing Talent Associate. Phil selected Jamie in July 2017 on the 13th programme. Jamie had never held a permanent, full-time role but had a strong work ethic. He was really confident at home and with friends, but it was a different story in the corporate glass building that he would be based in. Jamie picked up the role really quickly. He has been so supportive of his team from day 1 that when it came to the annual Graduation in December, Jamie didn’t stick around for the adulation and photos. He wanted to get back to his team as they were so busy with the Christmas rush! Today, I bumped into Phil who gave a glowing report on Jamie. ‘He always works late if necessary, supports the team and even covered two departments on his own. He really is up there with the great personalities we’ve had on Growing Talent’. It’s lovely to hear how well everyone continues to do. Jamie truly is a fab role model for others to follow. Next International Women’s Day – what does it mean to you?